A few months ago I reviewed Oakridge BBQ rubs, and I loved them. So, when I saw that they were offering a one-time-only limited edition Habanero Death Dust rub I was all over it. When I received the rub last week I immediately tasted it. Wow! This stuff packs some serious heat, but it's balanced with great flavor. 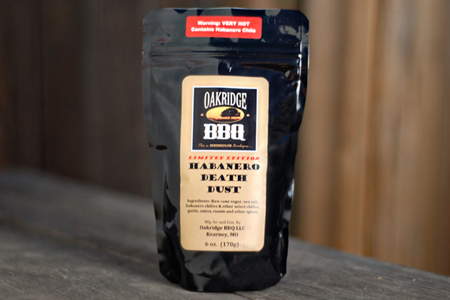 Oakridge BBQ's new Limited Edition Habanero Death Dust® features ultra-high quality ground 350,000 Scoville-rated Habanero chilies, smokey-hot Chipotle chilies, and 11 other herbs and spices. The aroma is earthy and spicy, with the fragrance of habanero chiles immediately present. The flavor profile starts sweet and savory with hints of raw cane sugar, molasses, and garlic then in about 3 seconds slams into high gear with the flavor and heat of habanero chiles. I love good sausage, and I thought that this rub would be perfect for some uber-spicy homemade kielbasa, and I was right. Here's what I came up with. 12 oz Uncured bacon (I used Hempler's), chopped to 1"
Combine all of the ingredients in a very large mixing bowl and stir well to combine. Split the meat mixture into three equal portions, put each portion into a gallon zip-top bag and refrigerate overnight. About 90 minutes before you're ready to grind and stuff the sausage, move the bags of meat to the freezer, along with your meat grinder parts (I use grinder and stuffer attachments for my KitchenAid mixer). Assemble your grinder for a small grind and set a large mixing bowl in an ice bath to catch the ground meat. Working as quickly as you can, grind the meat into the bowl in the ice bath. Cover the ground meat and refrigerate immediately. Prepare your stuffer with your casing of choice. I used 33mm prepared collagen casings from Cabela's. Working in batches, stuff the sausage into approximately four 18-inch portions, per your machine's instructions. Refrigerate the stuffed sausage at least two hours before smoking. Start your smoker and prepare for smoking at 275* with the smoke wood of your choice. I used cherry. Smoke the sausage indirect until it reaches an internal temperature of 165* (about two hours). Remove the sausage from the cooker and serve. 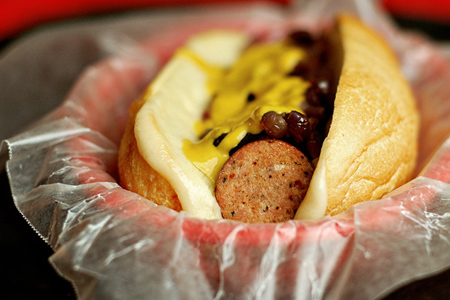 I served mine on a toasted roll with melted baby Swiss cheese, and I topped them with caramelized red onions and plain yellow mustard. Note: If you plan to serve the sausage the day after cooking it, simply let it cool at room temperature for an hour then refrigerate it in gallon zip-top bags. Now that is a way to use up rib tips! Holy habanero this looks good John. How was the final heat level? Thanks, Chris. 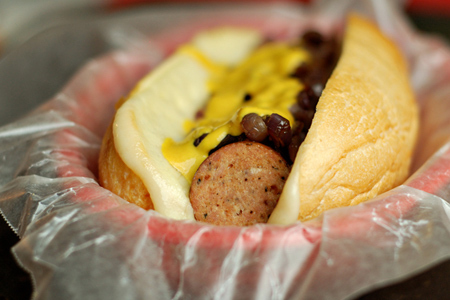 They were a little spicier than your average real hot link.